High quality and high style, this Safavieh Courtyard area rug is extremely useful in any home. Designed to decorate an indoor/outdoor space, this plush synthetic material rug is high quality. This machine-made rug makes long-term decorating easy. This beige tan rug has a stylish floral plants pattern for your modern dicor needs. This Indoor/Outdoor Ribbed Pattern Rug is a great way to dress up your patio, sunroom or any indoor/outdoor living space. Being constructed from 100% solution dyed polyester fibber helps make it mould, mildew and stain resistant for easy care and cleaning. This all weather rug is durable and also UV protected to help prevent fading. You can now have a great rug solution and at the same time be environmentally responsible since it is made from post consumer recycled plastic drinking bottles. Beautiful, versatile and weather-resistant, the Indoor/Outdoor Four Seasons collection combines the benefits of outdoor functionality with the style of indoor fashion. The color palette is lush with nature-inspired neutrals, soft greens, and rich reds while the transitional designs are perfect for your casual lifestyle.Orbison is going to transform your space into a modern design magazine. This rug perfectly exhibits the colors of blue, navy, light blue, brown, tan, beige and ivory to make a wonderfully patterned rug. It's even great outdoors! Unique and unexpected in its beauty, Wild Weave is a signature collection of stunning designs combining luxuriously plush texture, creative colour combinations and inventive style. Inspired by the latest trends in home fashion including both warm and cool colour ways. Oystershell is a classic oriental rug with a twist of transitional with unique floral design. Enhanced with elegant details this rug offers a crisp look for traditional and transitional interiors. Courtyard Zak Dark Beige / Beige 2 ft. 7 inch x 5 ft. Indoor/Outdoor Area Rug High quality and high style, this Safavieh Courtyard area rug is extremely useful in any home. Designed to decorate an indoor/outdoor space, this plush synthetic material rug is high quality. This machine-made rug makes long-term decorating easy. 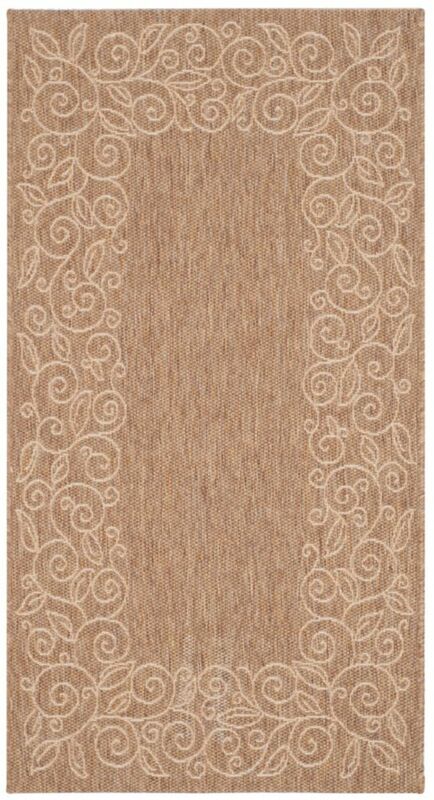 This beige tan rug has a stylish floral plants pattern for your modern dicor needs.